It is Fall of 1987, and I'm going to school in Provo, Utah. I have about a year and a half of climbing experience under my belt. I've been bouldering almost every day, cragging at Little Cottonwood or Rock Canyon most week-ends. My friend Matt and I are regularly leading 5.8 and occasional 5.9 climbs, and even easy 5.10's. I can do one armed pull-ups, I'm single, with time on my hands, although I've had a steady girlfriend, Dorothy, for a couple of years. Matt has been married about a year, and is spending a bit less time climbing with me than he used to, but we are still managing to get in a lot of time on the rocks. I feel like I'm ready to try something bigger and more impressive than the local rock climbing crags. Like most climbers, I'm drawn to Roper and Steck's book, 50 Classic Climbs of North America. 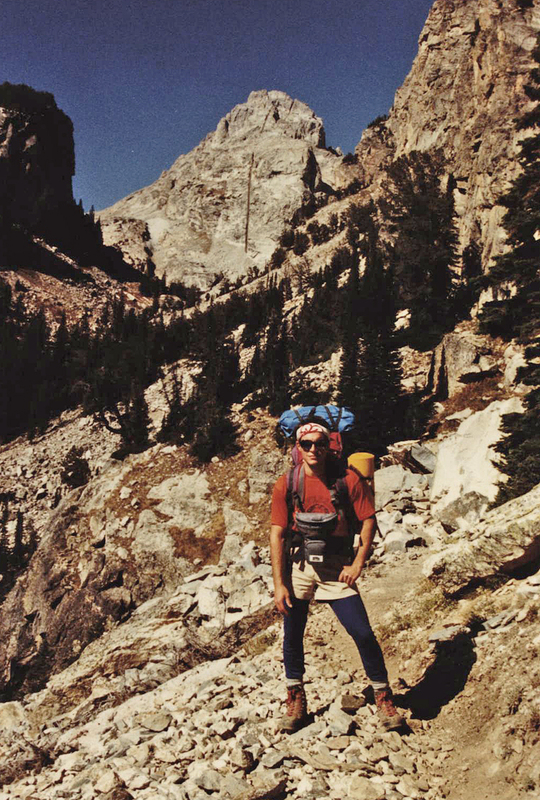 Most of the climbs are either too extreme or too remote for a relative novice like me, but the Direct Exum Ridge on the Grand Teton seems like a perfect first alpine rock route. It's rock-climbing in the lower fifth class, with the hardest pitch rated at 5.7. 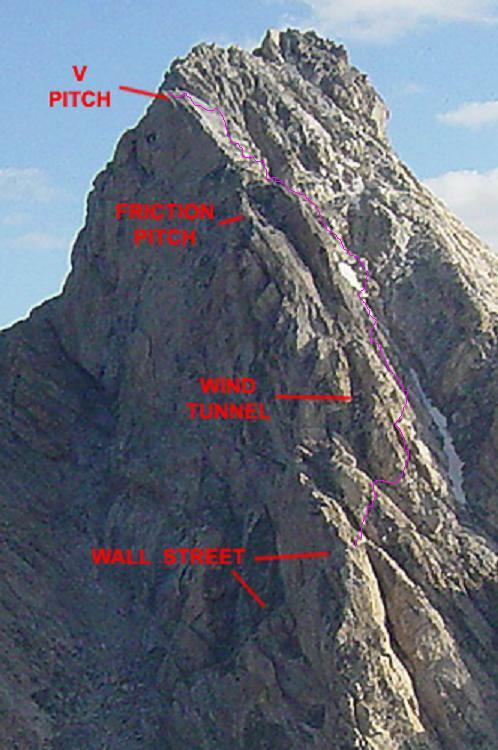 The only real technical pitches are on the lower section of the climb, below the ramp known as "wall street". It sounds pretty straight forward. Matt and I have been lusting after the Direct Exum for some time and he agrees that it is a good objective for the two of us; our first foray into "real" mountaineering. We make the decision to go, and begin the planning process, which for me has always been one of the best parts of a "big" climb. We create long lists of necessary equipment, carefully revising them every day, sometimes several times a day. 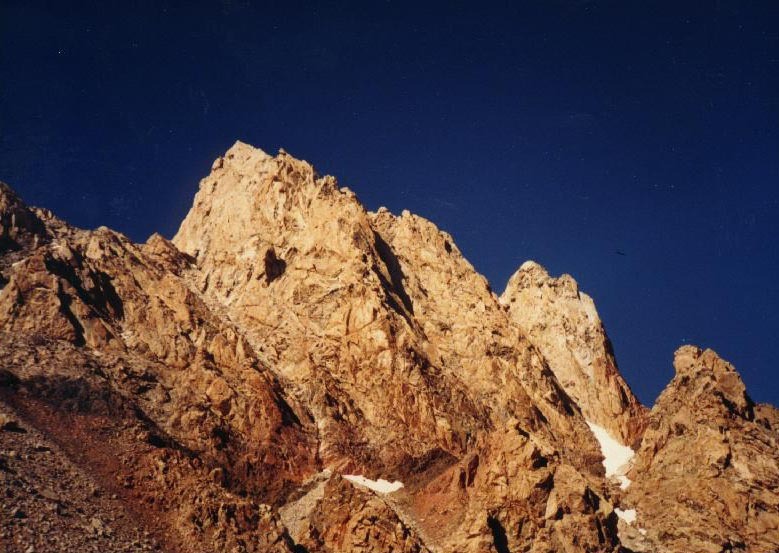 We pore of descriptions of the route in Fifty Classics, and in the small orange Ortenberger guide to the Tetons. The trip keeps getting postponed, however, due to school and work conflicts, and by the time we are able to get away, it is already September 24. We are in a nice Indian Summer, though, with the weather across the West very warm and dry. Friday morning, after filling up on Egg McMuffins, we register at the ranger station and head for the trail head. The elk are bugling and we pack our gear for the hike to the Lower Saddle surrounded by the strange sounds of elk mating calls. It sounds like aliens have descended on the forest. We cram our gear into our packs, strapping stuff on the outside that won't fit inside. We have decided to go as "fast and light" as possible. We are carrying only smallish climbing packs and are trying to make do with minimal gear. We have left our rock shoes at home, deciding to climb in the boots we are hiking up in (for me, a pair of heavy duty Raichle "Eiger" mountain boots.) The climb is only 5.7, we won't need rock shoes for that, and anyway, it seems to us that mountain boots are fitting for our first mountaineering trip. Our tent is a minimalist pyramid with no floor. Rather than a water purifier pump I've saved weight with an ultralight chemical system that involves super-chlorination of your water, followed by addition of hydrogen peroxide to neutralize the acidic chlorine, making the water safe to drink. We have done our best, over the past weeks of planning, to cut our gear down to the bare minimum. "Fast and light"; "Leave most of the 10 essentials and other impedimenta behind"; "Cut your pack weight to the minimum". We had read every book on mountaineering we could find in the library, and they all said the same thing. When I come to my puffy quallofill jacket, I'm already sweating, and I'm wearing only a t-shirt. It's late morning and the sun is already hot. I look at my overflowing pack and decide that the puffy jacket is superfluous. "Hey Matt, you think we'll really need these puffy jackets? I think I'm going to leave mine here." After a bit of staring at his own overflowing pack, Matt agrees that the puffy jackets can be left behind. After all, we are bringing sleeping bags for our camp at the saddle, and we'll be moving fast on the climb, so we won't be likely to get cold. We shoulder our packs and head up the trail to the Lower Saddle. It is a beautiful sunny day, and we are treated to gorgeous views as we slowly rise out of the canyon, laboriously hiking further and further up the steep trail. We eat lunch at a waterfall, make our way up the fixed rope that safeguards hikers through a steep rock band; follow cairns through a large boulder field. My eye is drawn to a snowy couloir on the Middle Teton. There are two climbers making their way up. One looks like a man, the other a boy, probably a father and son. I make a mental note that it looks like a fun climb, one which I should come back and do some day. We finally stagger up to the top of the lower saddle and set up camp. We can see our intended route on the Grand Teton. It is awesome and exciting. The lower saddle is almost empty of people. There is one other party, returning from a climb of the upper Exum. They are breaking camp, and headed back down the mountain. They show us where to get water and talk to us about their climb. When they ask us what we're climbing we proudly tell them that we are after the DIRECT Exum ridge, starting not from Wall Street, but at the bottom. 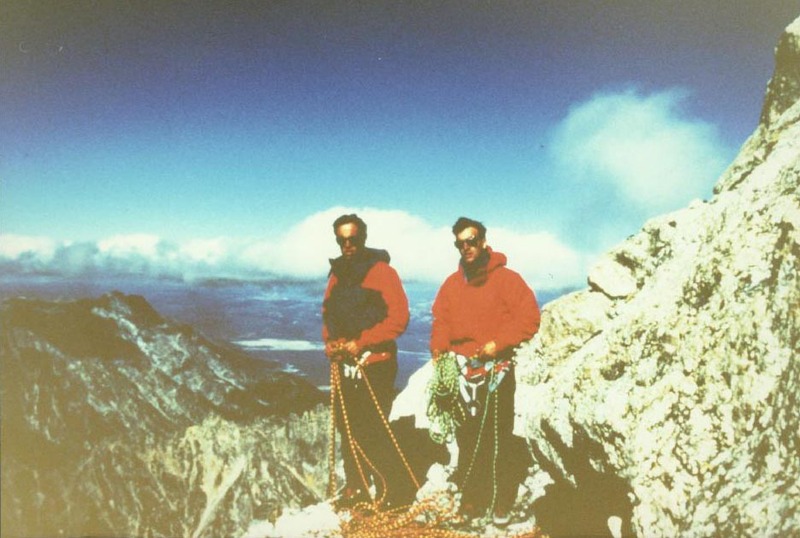 They are suitably impressed by our goal, and we feel very much like real alpinists. We go to bed early but have a hard time falling asleep due to our excitement. We are up the next morning before dawn, and set out toward the base of the ridge by the light of our headlamps. We begin the climb just as the Sun begins to rise, and we are soon established on the beautiful rock pitches of the lower Exum ridge. There are numerous chimneys, separated by slabs, with occasional traversing here and there. We are suspicious on several occasions that we have gotten off route, as the guidebook description is a bit vague in places. More than once, I regret not bringing my rock shoes. My stiff mountain boots climb reasonably well in chimneys and wide cracks, but for friction sections and thinner cracks, I find myself wishing for the trim toes and sticky rubber of my Firés. After several hours of truly delightful climbing, we finally pull up onto Wall Street, the big ramp that cuts across the side of the mountain, bisecting the Exum ridge. It is about noon, but we are pleased with our progress, particularly because our arrival at Wall Street signals the end of the technical difficulties. From here on up, it is mostly a scramble to the top. We take a rest and break out some food and water. Our food consists of foil wrapped army rations, "cherry nut cake" and "pork bar, dehydrated". The cherry nut cake is edible, but the pork bar is something like stringy brown sawdust. Having finished all the water in my small bike bottle, I dig out my one quart Nalgene and take a big gulp to wash down the unpalatable pork bar. One swallow of the water and I just about die. The water is caustic, burning my mouth, tongue, and no doubt my tonsils as well. I spew it out, choking and coughing. Matt sees me and asks what's wrong. "I super-chlorinated the water, but forgot to put in the neutralizer." I say. He asks if I brought the neutralizer along, and I confess that I didn't. He pulls out his nalgene and examines his water. It too is super-chlorinated. My mouth is dry from the mountain air and the attempt at eating the dehydrated pork bar. I sniff at my water bottle, wondering if perhaps the water may be drinkable in small amounts. Just smelling it makes my eyes water and hurt from the heavy chlorine fumes. The polyethylene bottle has turned a shade of light brown, I guess from the acid in the water. I realize that I may have gone a little overboard with the amount of chlorine I had put in. Reluctantly we pour out all of our water. We aren't too worried, however, as we figure that we aren't that far from finishing the climb. We turn our attention back to the route. We are at the top of Wall Street, the end of the technical section. The guidebook points us to "a large slabby rock". We see a yellowish section of slabby rock to our left, and another, seemingly easier slabby rock to our right. "Which way? Left or right?" After long deliberation, we decide that the slabby rock on the right looks a bit easier, and that probably indicates that we should proceed to the right, as the route is supposed to be easy above Wall Street. We set out to the right, and the climbing begins easily enough, with some friction and crack climbing. Soon, however, as I go higher and higher, I find myself wanting to place protection, something I shouldn't have to do if this was truly a non-technical stroll to the summit. After the first pitch, Matt and I have a discussion. "Do you think we are off route? Maybe we didn't go far enough to the right." We get out the guidebook again, trying to correlate guidebook descriptions with the rock formations in front of us. We ultimately decide that we are a little off route, and that we need to go further right to get back to the easy section which will lead us to the summit. Matt leads the next pitch, and I can tell that it is not easy, but we both are sure that at the end of this pitch, we will find our intended route. We continue for several more pitches, bearing right each time until we arrive at a small ledge below a steep pitch capped by a small roof. We know by now that we are lost. We have no idea where we are in relation to our intended route. The weather has also taken a turn for the worse. It was much colder now, and the wind begins to blow harder and harder. After a while, we decide that the only sure way to get back on route is to go up. After all, the Exum route ends on the summit. If we continue upward, we will eventually reach the summit, so if we simply go up we will ultimately get back on route. I lead the next steep pitch. The high winds are strong enough by now to make my gear and strings of carabiners stand out sideways from my body like flapping flags. I struggle with the roof, and fall, setting my pink tricam permanently in the deep finger crack I've been working up. On the third attempt, I finally pull through the small roof, helped quite a bit by a very strong wind gust which pushes me upward, taking some of the weight off of my arms. Matt follows me up, finally abandoning hopes of retrieving the tricam, and we continue up a series of steep slabs, flakes, and narrow squeeze chimneys. We are tired, hungry and above all, thirsty, deeply regretting our lost water. The wind is increasing, the cold is beginning to numb our fingers, and we can see dark clouds blowing our direction. It is evening, and daylight is fading away. We slowly realize that night is going to catch us before we get off this mountain. We begin looking for a spot to bivi. We climb one more short pitch and come across a shallow chimney with a sloping slab which is large enough to hold two people. It is the flattest and most sheltered spot we've seen since we pulled the roof several pitches below us. We cannot bear the thought of rappelling back down below the roof and giving up our hard won altitude. More immediate, we are both demoralized and want to simply stop and rest. We anchor ourselves into some nuts we place in the back of the chimney and begin to prepare for our bivi. We spread our ropes out under our butts, and I take the foam frame out of my pack and place it against the back of the chimney for us to lean on. We stuff our legs into our backpacks and pull the extension sleeves up to our thighs. On my legs, I'm wearing lightweight capilene underneath some Patagonia stand up shorts, covered by entrant shell pants. On top, it's lightweight capilene under a synchilla cardigan covered by a gore-tex jacket. I have a light weight capilene balaclava for my head. Matt is similarly dressed. We had already started to get a little bit chilled while we were climbing, but now that we have stopped, the cold begins to really set in. We are both tired, hungry and majorly dehydrated. The cold gets worse as the Sun disappears, and the wind begins to increase. We sit perched on our little hollow and begin to shiver. The wind is battering us, and we feel a few drops of sleet begin to fall out of the dark sky. We know that we are in trouble if the weather turns bad. We have no bivi sacks and our shallow chimney offers little or no shelter. We begin to think about what would happen to us in a major storm, and our conclusions are not comforting. We decide that we are in a situation where a prayer might be a good idea. We are cheered up quite a bit when the wind does in fact die down and the storm clouds pass, within five minutes of Matt's prayer. We are looking out at a clear, calm starry night sky. My estimation of our chances for getting off the mountain raise quite a bit, as does my faith in a divine being, who appears to have taken an interest in our plight. The night gets colder and colder. We have no water and the only food we have left are the dry inedible pork bars, which we have dubbed "ca ca burgers." We do what we can to stay warm; placing stuff sacks over our heads and ears for an extra hat, hugging each other and rocking back and forth, trying to move about and work our muscles as much as possible on our cramped stance. In spite of all this, the cold soaks in deeper and deeper, and soon we are both shaking uncontrollably from cold, our teeth chattering so hard we can hardly talk. This goes on for several hours, until I notice that Matt has stopped shaking and appears to have drifted off to sleep. Like just about everyone else in the world, I know that people who get too cold fall asleep and never wake up, so I begin to make efforts to rouse him. "Matt!, Matt! Wake up! You can't fall asleep!" He grunts at me, but otherwise doesn't respond. I begin to shake him vigorously, yelling at him, but finally he just mumbles to me to leave him alone. I persist in abusing him verbally and physically until I finally get his attention. I tell him he has to keep talking to me, that he isn't allowed to stop talking. He still doesn't respond, so I shake him a few more times, until finally he says, "What should I talk about?" I tell him to talk about his wife, "What do you like about her?" I ask. "She's soft" he responds. With further urging, punctuated with shaking and slapping, he begins telling me about his wife; about how much he loves her, about the first time they met, about all of her good qualities and his feelings for her. As he talks, he begins to get renewed energy, and becomes less interested in falling asleep and more interested in keeping himself warm and alive. The night passes extremely slowly. We talk, we sing songs at the top of our lungs, we stretch, we hug each other, rocking back and forth, we shiver. At several points I'm jerked out of a semi-comatose state by Matt whacking me and telling me I need to wake up. As the night goes on, I get progressively worse and worse off, although Matt seems to stabilize somewhat. Without each of our efforts to keep an eye on the other, I think that we both would have died up in that crack. During the night, w estimate that the sun will likely come up at about 5:00 o-clock, and are extremely disappointed when it does not begin to appear until over an hour after that. Finally, the dawn breaks, and the sun begins to warm us up a bit. Just the sight of the Sun's rays lifts our spirits immensely, although we are still weak and a bit dizzy from our night on the mountain. My mouth is so dry that I can't even spit or swallow, and my tongue is swollen and my lips cracked so that it is difficult to talk. Matt too is having the same problems and when we talk, we croak at each other like sick frogs. Slowly, we set off upward again, knowing that we have to get off this mountain as soon as possible. Climbing half a rope length above our miserable squeeze chimney where we spent the night, we encounter a beautiful wide, sheltered ledge, the perfect bivi site. This only accentuates the discomforts we had suffered during the night. Grumbling loudly, we keep climbing up and up. Although there are several pitches of easy 4th class ground that passes quickly, much of our climbing is slow and steep and strenuous, placing protection as we go. We finally come to a huge slab, relatively low angle, with small seams leading up. On the extreme left of this slab is somewhat higher ground, and we see three climbers moving quickly and easily along this line. We realize that they must be on the Exum route, and if we can work our way up and to the left we can get re-established on the long sought after easy ground. This involves one last lead, traversing up and left along the slab, with only a single piece of protection for the first ½ rope length. Climbing the slab, smearing with my mountain boots, I am really wishing for my sticky Spanish rubber shoes. We finally reach the Exum ridge route again, and are immediately faced with another route finding dilemma. There appears to be a choice of either a path that takes a leftward direction, or a path to the right which ascends towards the summit blocks. The party we had spied out from below is long gone, and there is no indication as to the correct route. The guidebook is, as usual, quite vague, and could be interpreted to support either choice. Matt is of the opinion that we should take the left hand route. He believes that it will take us to the rappel station. I think we should go a bit higher, but I had also thought that we should go right at the end of Wall Street, so I defer to Matt's inclinations. We take the left path, skirting the summit on our right. We finally come around to the spot where we believed the rappel down should be. Even now, we are unsure of which way to go. After a great deal of consideration, we finally decide that the rappel must be down a steep section leading into a gully. It is so steep that we couldn't quite see where it ended up, but are pretty sure that this must be the place. We are tying some slings around a rock as anchors for our rappel, when we hear someone yelling at us. We turn around and there is a guy in shorts, a windbreaker, and running shoes, descending from the summit blocks moving toward us. "What are you guys doing?" he asks. We tell him that we are just trying to get down, and he informs us that we are about to rappel down the Black Ice Couloir. "The rappel anchors are over here" he says, as he heads off in the opposite direction, disappearing as suddenly as he had appeared. Relieved that we have been saved from yet another boneheaded mistake, we remove our sling anchors and head off in the direction where we saw this stranger go. We arrive at the rappel anchors, which are obvious because there are half a dozen slings. We rappel down, and give ourselves high fives, then take a couple of pictures to celebrate our success. Our happiness is spoiled for a while when our ropes get stuck while pulling them down from the anchors, but after about 15 minutes of tugging and whipping the ropes back and forth, they finally come slithering down. After that, it is a long, grinding trudge back down to our camp at the lower saddle. After a while, we are so exhausted and thirsty that we are finally unable to take more than a few steps at a time before we need to rest. My mouth is dry and my throat is tight from lack of moisture. I experience brief lapses of consciousness as I move slowly down the mountain. The path is not difficult, and we would be down quickly if we were not so beat up, but our pace is agonizingly slow. We hope to see other climbers from whom we can beg some water, but we are alone on the mountain. At one point I see, on the path about 10 feet from me, a large North Face Chameleon back pack. I yell at Matt, who is a short distance ahead. "Matt! A pack! A pack! Maybe we can borrow some water!" As I eagerly step over to the pack, it becomes clear that my eyes and addled brain are playing tricks on me, and that I am staring at a large grey rock. Disheartened, we continue slowly down the mountain, drawn on by thoughts of the hot drinks and food awaiting us at our camp. We finally come over a lip and can see the lower saddle below us. We can barely make out our blue and black pyramid tent surrounded by a low rock wall. Matt suddenly starts yelling to me in a croaking voice. "Hey, look at that, there's people in our tent, they are taking our food and water!" I strain my eyes to see "Look at that! They are taking our stuff out of our tent." I keep looking but I can't see anything which even remotely resembles a person near our tent. I tell Matt this, but he keeps staring at the tent for a while. Finally Matt says that maybe he imagined it. Remembering my mistake with the phantom back pack earlier, I write it off to the effects of exhaustion and thirst. We sleep until about 2:00 a.m. when we wake up and spend about an hour eating and drinking. We would have liked to have slept in later, but we know that we are overdue, and want to get down and let folks back home know that we are all right. We pack up and hike down the long trail back down to the parking lot. The weather is beautiful, the Sun is shining, and the Grand Teton looks beautiful. Along the way we meet a couple of guys coming up with full ice gear. They are here to do the Black Ice Couloir. We don't mention to them that we almost rappelled down their intended route by mistake. We head for the car with all the speed we can muster. As we get pretty low down the mountain, we meet a familiar face. It is a guy named Stuart, a friend of Matt's. We are quite surprised to see him. We find out that Matt's wife, Sharon, having not heard from him when expected, had called the ranger station to find out if Matt had come back down. She was informed that we had not checked out and that our car was still in the parking lot at the trail head. She became quite alarmed, and asked that the rangers institute a search for us, but the rangers (quite reasonably) declined to look for us until we were more than 24 hours late. Not knowing what else to do, she called Stuart and asked him to drive to Wyoming with her to search for her husband. (Now THERE is a faithful friend!) To my surprise Stuart tells us that both Sharon, Matt's wife, and Dorothy, my girlfriend are in Jackson. He thinks they might be at the ranger station trying to convince the rangers to start searching for us. It begins to sink in that our late return has truly frightened our loved ones back home, and we pick up our pace as much as possible. We arrive at our car at the trailhead just in time to see Sharon and Dorothy drive up. They are extremely relieved to see us safe and sound, and burst into tears. We go out for brunch at a restaurant in Jackson and I eat a huge pancake breakfast. We tell our story to Sharon and Dorothy and they are horrified. "Don't worry," I say, "We will NEVER do anything like this ever again." I really mean it. So does Matt. Both of us repeat over and over again that we will never attempt any climbs in the mountains again. Our recent experience has taught us that alpine climbing is reserved solely for maniacs with a death wish. Too much suffering, too much danger, too much uncertainty. We even say that we may not do much rock climbing in the crags anymore. Were it not for the fact that I had all this expensive gear, I might even consider quitting climbing altogether. I ride home with Dorothy in my car, and Matt and Sharon ride home with Stuart. All the way home, I assure Dorothy that I am giving up climbing in the mountains for good. I am particularly sincere, because the skin all over my body (especially my hands, back and shoulders) is beginning to sluff off in alarmingly large patches, kind of like a shedding snake. I'm not really sure why this is happening, but suspect it may have something to do with cold and dehydration. I give Matt a call, to make sure he got home safely. I confess to him that I looked at the IME catalog, in spite of my vow that I was no longer interested in climbing. He tells me that he too succumbed to the temptation and that Sharon caught him reading the catalog while he was soaking in a hot bath. She took the catalog away, but he's rescued it out of the trash and has it hidden in a safe place.